The EM7004 EtherCAT module interface is optimised for direct connection of four Servo Drives. The compact module features four integrated incremental encoders, 16 digital 24 V DC inputs and outputs, and four analog ±10 V outputs. For fast preprocessing, the digital outputs can be connected directly via the four encoders (PLS). This function is parameterisable. All inputs and outputs operate with a 24 V supply. The plug connectors X4, X5, X6 and X7 each feature an encoder input and an analog output. The connectors are galvanically isolated from each other and from the supply voltage. 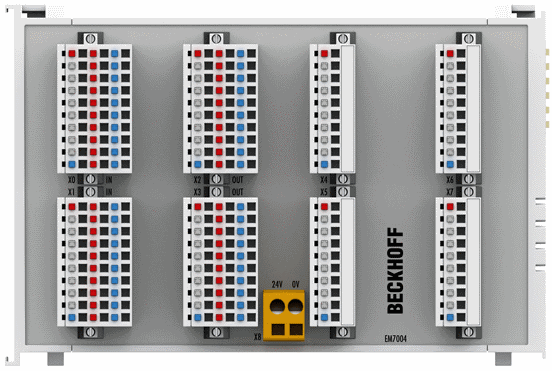 The connectors X0 and X1 with 16 digital inputs as well as the connectors X2 and X3 with 16 digital outputs enable 3-wire connection. Plug X8 is included in the scope of supply.